Maybe the best thing about coming home from vacation, besides snuggling my pup in my own bed is coming home to a house full of packages from the UPS guy. I mentioned the other week I was waiting for a delivery and my breakfast nook navy chairs finally arrived. It made reentry into the real world not to mention the snow (why Michigan why?!) a little less painful. I know a lot of you loved the Ikea wicker chairs that were here before, but they were just hanging out here on a pit stop until I found something I loved. The truth is they weren’t totally comfortable to eat in, because they sat so far back from the table. I also felt like it was all very beige over here and I craved more color. Now that we are settling into the house more, it’s been fun to really hunt for the right pieces for each space. Some of our spaces just have things from the old house kind of forced into them while I take my time designing the space. When I was looking for new chairs, I really wanted something a bit more transparent feeling. The wicker chairs blocked a lot of the pattern and texture that the pillows brought into the space and I like that these allow you to see the color more. Also, since you only see the backside of these chairs 99 percent of the time, I wanted something with more visual interest on the back. These were perfect and I love the beachy vibe of the rattan. They photograph a bit more black, but they are a pretty navy in person. I’m also still on the fence about painting the table a light grey as well. 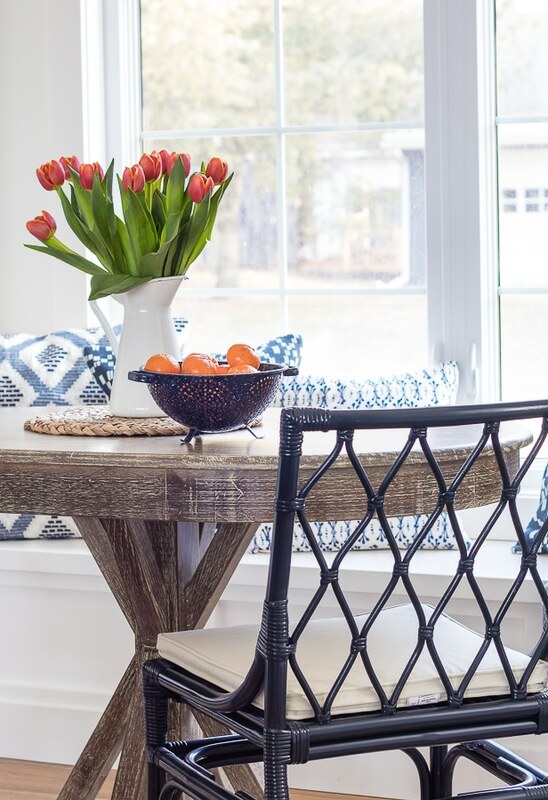 I don’t love the finish on this table, but it is super practical for our family because we eat here every night and it cleans up really easily. So we will see if my practical side wins out or not! Oh and a quick note on the lights above our island, I get a lot of questions about whether they are the black with chrome or oil rubbed bronze. They are the black, but I actually spray painted the chrome part with a matte black spray paint. They used to have all black available, but they don’t sell them anymore. So if you are looking for an all black option spray painting them is super easy. Thank goodness for good ole Trader Joe’s $5 tulip bunches since snow is on the way again even though it is mid-April! I actually had a reader ask recently what I keep on our every day table (you know I love our herb baskets on our dining table) and I usually try to grab a grocery store bunch of flowers to get me through the winter. I use fresh cut flowers from the yard in the summer. Something simple that’s easy to remove since we do eat here every night. I also put a bowl of fruit otherwise too, to try to trick my kids into grabbing one. Here’s hoping spring has hit by you, and if it has, send some good sunshine vibes up here to the Mitten! Hi Lisa, I am so far. We have only lived here 10 months so I don’t know about long term wear. The only thing I do to care for them is vacuum (I have one of those roomba things) and then use a Norwex mop that’s very barely damp maybe once a month. They really don’t recommend mopping wood floors because they do not like moisture (especially with the more raw feeling finish of these floors) so I find vacuuming really takes care of any dirt. But we also don’t wear shoes in the house so that helps too. Thanks Kelly, good to know. I’ve enjoyed following you thru the home building process – you’ve done an outstanding job! OH good luck, it’s so fun (and stressful) but worth it! 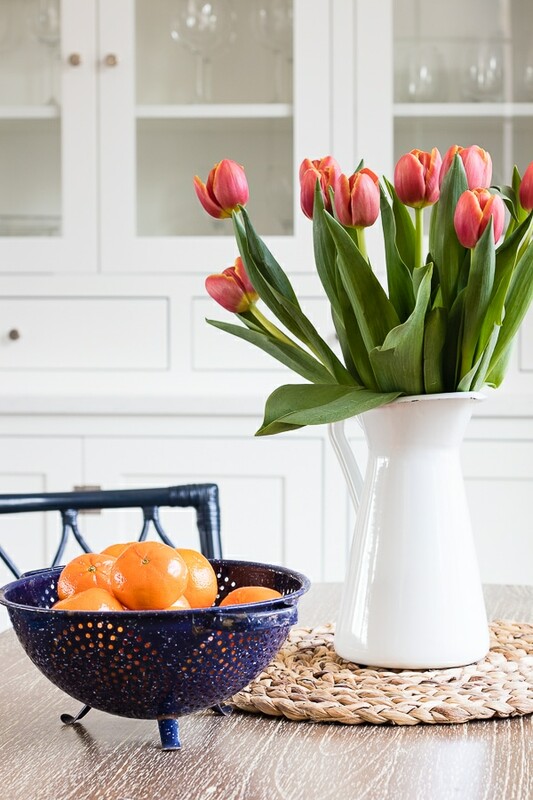 I absolutely love all the navy throughout your home. 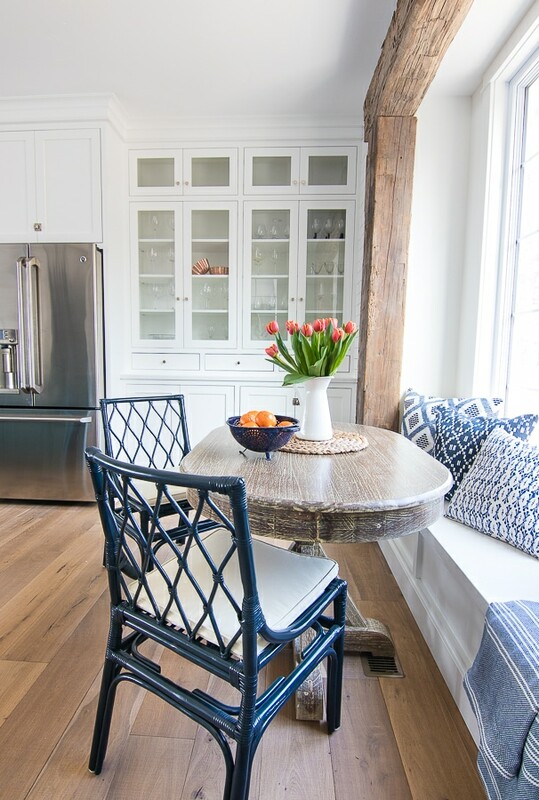 Navy is my favorite color to wear and I think I need to bring more navy into my home! Hope Spring arrives in your area soon. We are chilly here in South Carolina. Warm weather needs to get here and to stay. Thanks Beth, I love love Navy too! Thanks for the warm wishes sounds like snow all weekend argh! Love the chairs- great choice! Hope it warms up soon for you and you get some spring weather! Love everything about this nook. 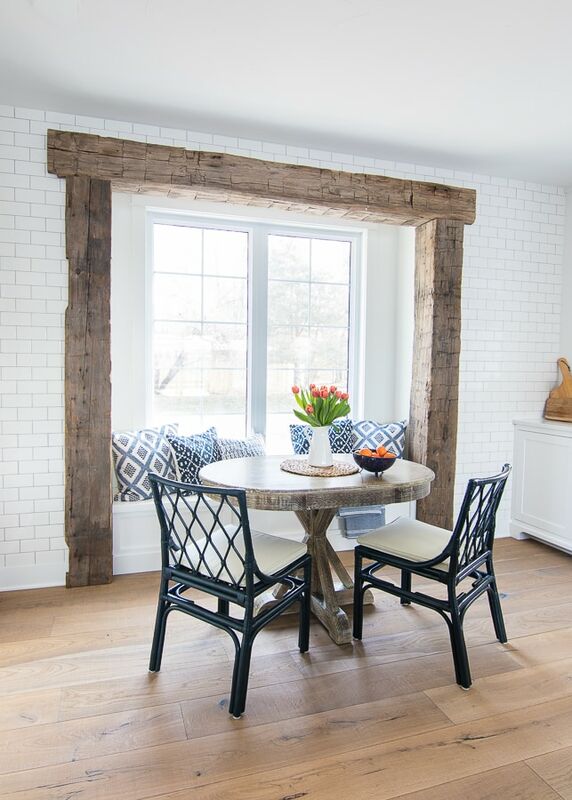 Please don’t paint the table :( it is perfect with the natural wood framing around the nook! Love your home. You have a gift! 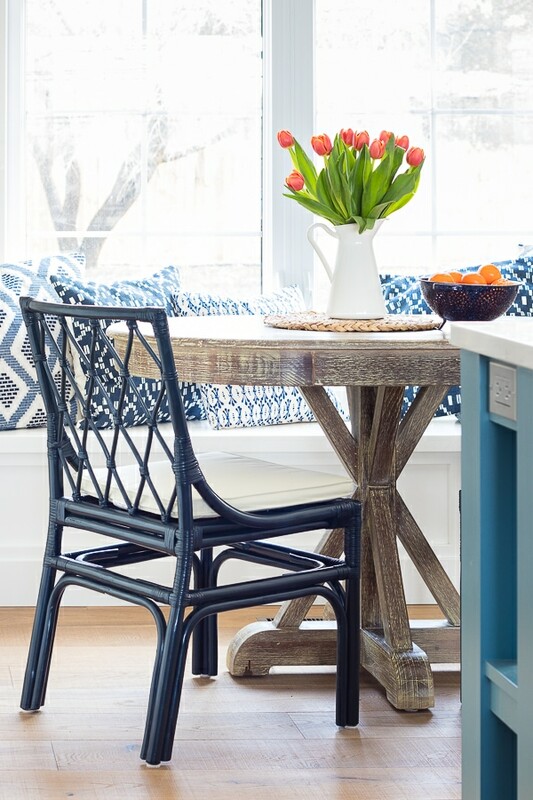 Love the breakfast nook colors! Navy has always been my favorite color! The colors are so crisp and clean! Great job! 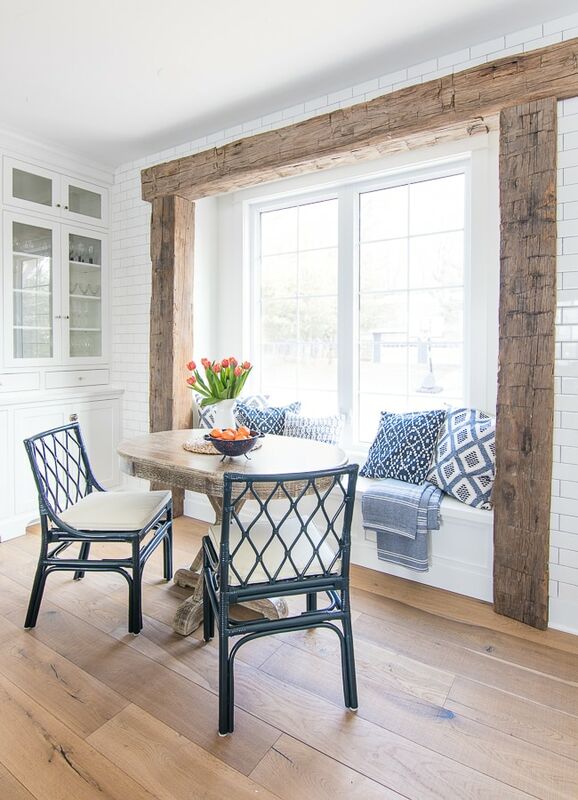 I LOVE the way the wood table ties in with the beams and bar stools and would not paint it at all as (in my opinion, but who am I), grey would be too neutral. 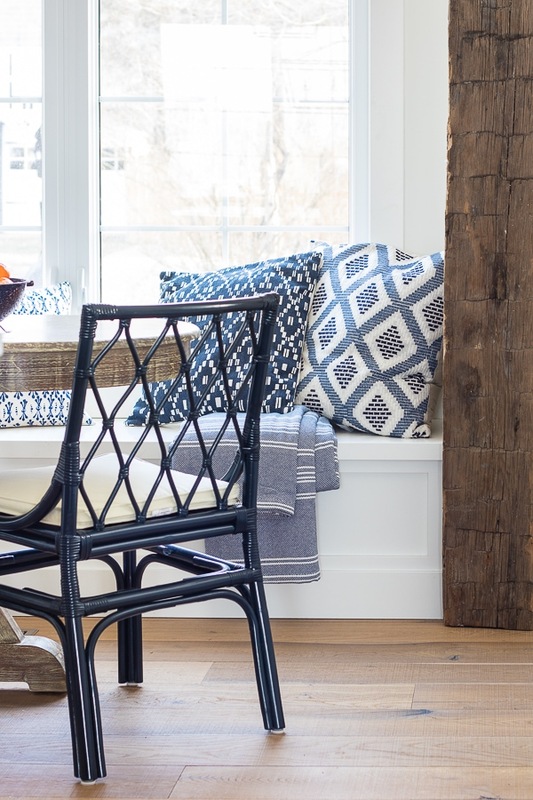 Love your idea for a navy striped cushion on these terrific chairs. This kitchen is so beautiful. Would love to see it again with the new chair cushions. Hi Debra, I agree I like how the wood tones tie together I just wish the finish wasn’t so weird on the table. I should take an extreme close up sometime so you all can see what I mean. It’s kind of shiny which is probably why it cleans up so well! That could be a good solution! I love the size and shape of the table and even the color from far away but it has an unusual finish close up for sure. Hope you survive the winter weather we are supposed to have this weekend over in Chicago yuck! The chairs look great! I also love your blue accents. I am wondering if you have discovered a solution for sliding chairs on wood floors. My floors are similar and chairs with someone’s weight in them, are scratching them. I’ve tried various stick-on or nail-in felt and plastic options and they either do not prevent scratching or wear through quickly. We just have those felt pads on the bottom and I’m pretty careful about replacing them if they seem to be falling off. I guess we are pretty good about not scooting in the chairs with our full weight on them? I’m not sure, so far no scratches but we have only been here 10 months. Oh..those new chairs are so perfect!! Great find and thank you for sharing. Loved the instagram video too. I think Ive asked before but can you share the size of your windows in this nook and spacing between the two (are they mulled?). The window seat itself is 7 ft long so I think the window is about 5 ft wide, it’s just one big window so there is no space. It should be emailing you when I respond, maybe check your spam? I know sometimes it ends up there hmmm unless something is broken on the back end of my blog, I’ll check it out! 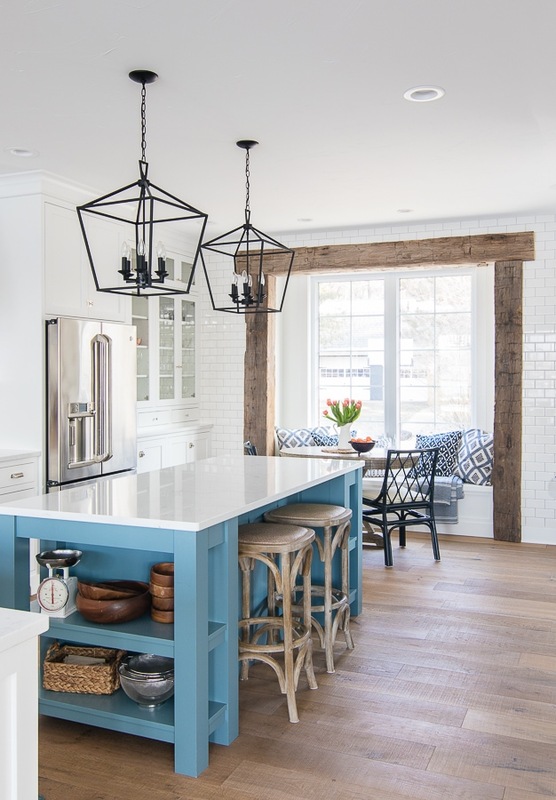 Agree with so many other commenters: Love your house, love the blue accents, love the new chairs. You mentioned the possibility of replacing the white chair cushions with a blue and white stripe. You might want to consider using an indoor-outdoor fabric. The last time I checked, Sunbrella had a nice blue and white stripe. (One downside: I’ve been told that it’s kind of hard to sew with this fabric, especially if you want to use welting trim.) Regardless of the kind of fabric, blue and white stripes would look great. Oh that’s a good idea! Mostly my husband and I sit on the chairs and the kids have the bench for easier clean up but outdoor fabric would be a good safe guard too! Love this space, those chairs are so gorgeous, & I’d never normally pick something like that but seeing it with whites, now I want them, the same ones!! 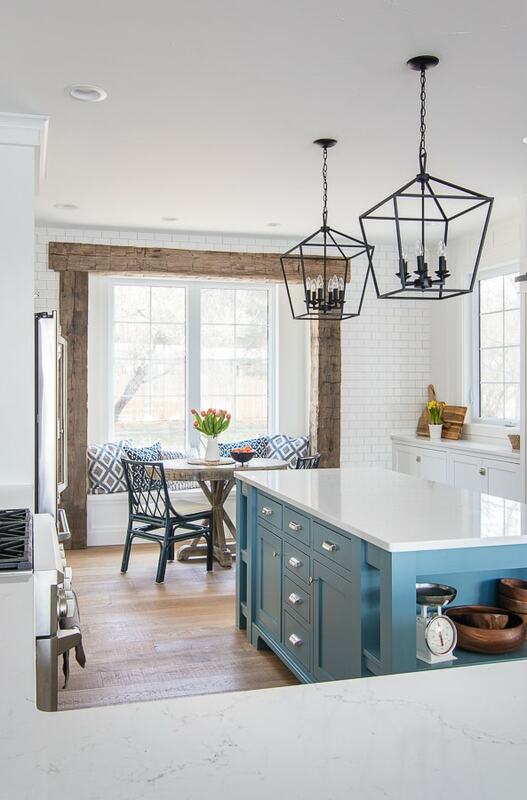 !…great job, just perfect, practical, easy-care items, pop of color, & that beam is everything, wow, what a dining/kitchen space! Thanks Erika, I was a little nervous about choosing them too at first but I love the pop of color in our space!